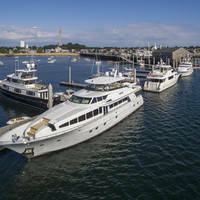 Manchester Harbor is located on the northern portion of Massachusetts northern East coastline. 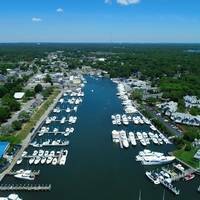 Manchester Harbor is about six miles northeast of Beverly and Salem, and 12 miles southwest of Cape Anne. 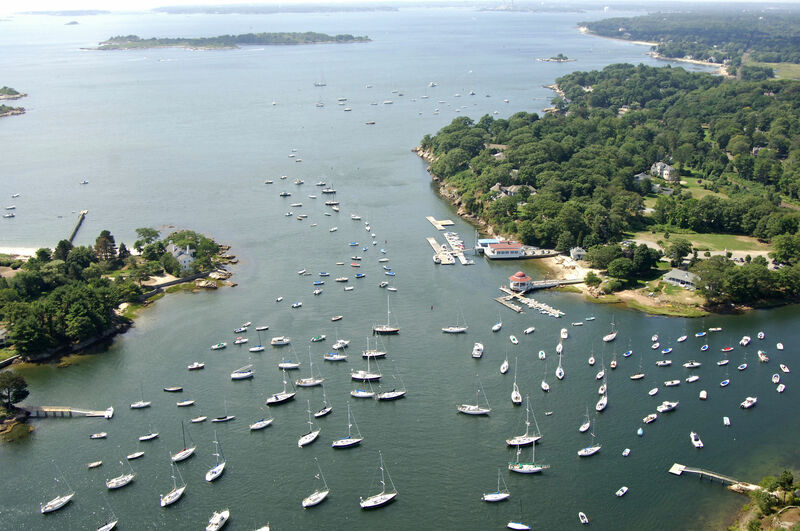 The image above is a view from the southwest looking northeast over the entrance to Manchester Harbor. The first set of marinas on the left (northwest) side of the harbor are located at Tucks Point, while farther back, also on the left, Nortons Point can be seen (lots of trees) just before the large red building. 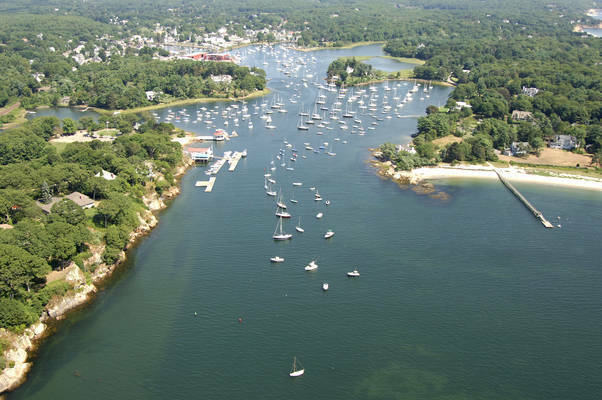 The small piece of water on the right (southeast) side of the harbor is Proctor Cove, which has an anchorage with seven-foot depths over a mud bottom with good protection. Manchester Harbor is reached via an approach from the south between Great Misery and House islands. Most of the approach is fairly straightforward, but there are some rock outcroppings that you will need to keep an eye out for. Luckily, all of them are well-charted. After clearing green can buoy 5, set a new course of approximately 330 degrees magnetic for 1.8 miles north of green can buoy 7, Bakers Island and flashing green buoy 9. Whaleback, a large rock outcropping, is about .6 mile north of Bakers Island and is marked by red daybeacon 8. You can pass this mark on either side as you near the channel between House and Great Misery islands, but make sure you give it plenty of room, especially on the southern side; there is a five-foot-deep rock due south of the mark. Staying south or north of the mark by about .1 mile will keep you clear of any danger. Once you have cleared red daybeacon 8, you will head northwest to intercept green daybeacon 1, which is between Great Misery and House islands; the daybeacon marks the location of a rock that is awash most of the time. The next two buoys are located to the northeast of House and Ram islands. Red nun buoy 2 and red nun buoy 4 mark the location of a rock ledge. As you continue to the north-northwest you will find green can 5, and then a series of green cans and red nuns that lead up into the harbor. 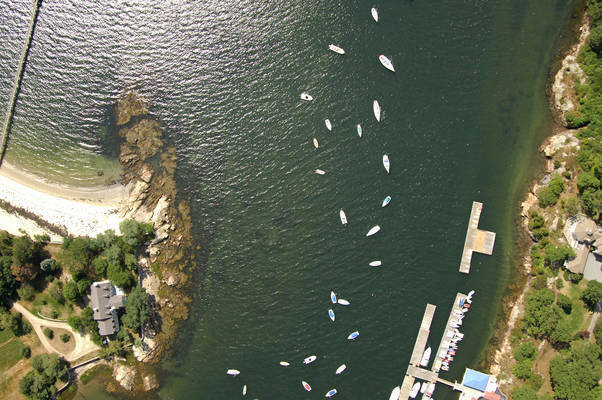 There are mooring buoys and anchored boats everywhere outside of the marked channel, and note on the chart that there are no lighted aids to navigation into the harbor; nighttime navigation can be a challenge. No reviews yet! 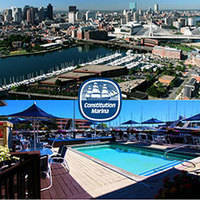 Be the first to write a review of Manchester Harbor Inlet.